Finally, finally, FINALLY I have gotten around to using raw fish in my sushi! I know, I know, it’s been over a year, but can you believe I used to not eat raw fish? Yeah I know blasphemy, right? (It’s not my fault… I didn’t grow up eating fish because my mom is allergic!) Well don’t worry, I have seen the light! Hehe. I now love sushi that uses sashimi… and Son of course is completely addicted. Soooo good! Yay for the holidays! I’m excited for the upcoming week… well, sorta. I’m excited for Christmas, but as for the rest of the week, it’s gonna be bleh. Why, you ask? I. Have. Jury. Duty. Waaahh! Luckilly when I called in I found out that I don’t have to go in Monday (which was supposed to be my start date), but I still will be on call for the rest of the week. Poo. This is my first time, and I’m really really hoping I can get out of it and not have to serve until the next time my name comes up. Here’s hoping! Happy holidays to everyone! For those of you who are travelling, have a safe trip! Cut each sheet of nori in half. Using a sharp knife, slice the tuna into 1/8 – 1/4 inch thick slices against the grain of the fillet. Cut each of these slices in half lengthwise, so they are about 1/2 inch wide. Roll the sushi, using several slices of tuna as your filling and using only a half sheet of nori and 1/4 cup sumeshi for each roll. RAW FISH IS THE BEST! I enjoy cooked sushi, but prefer raw or straight-up sashimi the most. 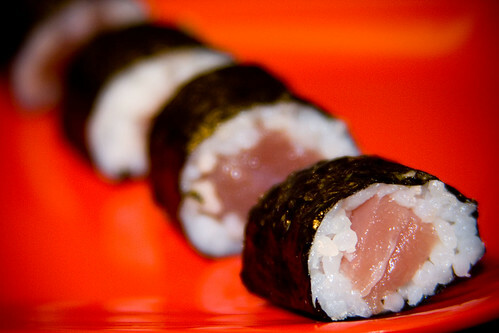 If I could, I’d buy a sushi grade steak of tuna or salmon, and just eat it. Yes, I really would. I’m odd! Just wanted to stop by and say happy holidays to you, Allison. I am so happy to have found you and your wonderful Sushi Day. You keep on inspiring me! And congratulations on your first RAW fish sushi roll! Welcome to the crowd! LOL! It will e easier fro me to tempt youinto my blog from now on! By the way, have you ever heard of SushiErasers? Have a look! LOL again! A Happy New Year to you, Son and all your dear ones! Haha, can you believe I used to not like raw tuna? At. all! Delicious looking as always! Happy holidays to you & yours! Robert-Gilles – 🙂 Thanks! No I haven’t heard of them! Sounds intriguing! oh how i do love tuna rolls. and now i can make them myself. thank you. Helpful Hint: search yummy recipes from your mobile phone using Boopsie. perfect for recipes on the go. Ummm, that is so cool that you like that series of books and sushi!! I just bought a sushi knife from a friend who works for Cutco. 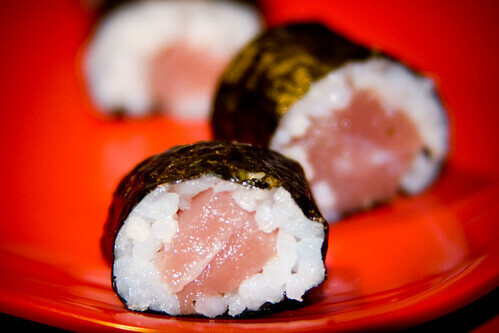 Mmm, I love making and eating sushi! Vane – I’m so sorry to hear that! 🙁 Maybe you can try again somewhere with a really good reputation? You could have just gotten some bad fish… hopefully you aren’t allergic like my mom! Hi Dominick! No you cannot make sushi-grade fish out of ordinary fish. 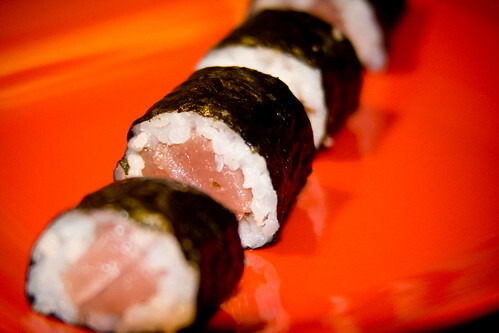 Sushi-grade fish is fresher than normal fish, so bacteria doesn’t have as much time to grow. I believe most sushi-grade fish is flash frozen anyways out on the boat when it is caught, and I’ve heard that there are online retailers who sell sushi-grade fish that is flash frozen and then you defrost it (I would assume they give you directions for this) when you receive it.